Despite the confidence in our decision-making, research from 2002 Nobel Prize winners Daniel Kahneman and Amos Tversky shows otherwise: Our own biases, combined with poor processes and preparation, lead to poor decisions. The Meeting Engagement Score™ is an industry first. It empowers organizations to rethink their approach to meetings and enables them to increase meeting effectiveness and improve decisions-making. If attendees do not look at the agenda or materials ahead of a meeting, they cannot have informed discussions. At best, this leads to wasting time and at worst, it can result in poor decisions that negatively impact business performance. Meetings scheduled through Decisions are assigned a Meeting Engagement Score™. The score – from 0-100 - is based on factors of engagement and agenda effectiveness and is weighted toward the most important agenda items. Engagement with topics requiring a decision, compared to those for discussion or information, are marked with greater importance. Participant Engagement: Have participants looked at the agenda in advance? Did they review the materials? Are people leaving comments or suggesting agenda items? As meetings attendees engage with the agenda and related materials, the score increases to reflect how ready they are to discuss important topics and make informed decisions. Agenda Quality: The score also considers the quality of the agenda and likeliness that it will engage team members. Are topics just one-line without context? Is time allotted appropriately given the content of the topic? Are owners assigned to each topic? Are there details, comments or attachments to better inform attendees about a topic? Was the agenda shared far enough in advance that participants had time to view it? 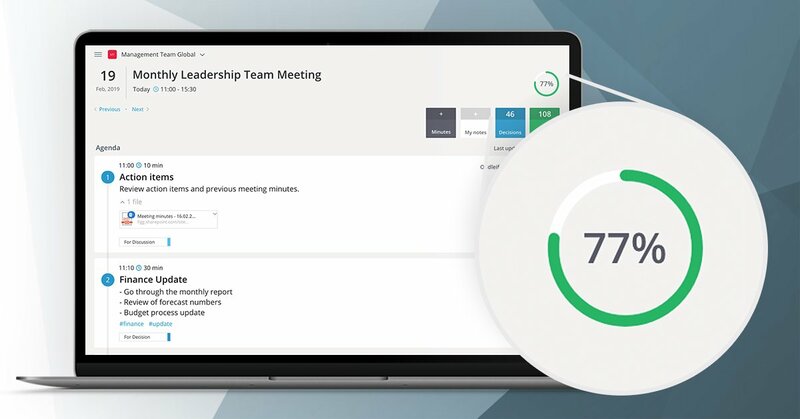 The Meeting Engagement Score™ helps Decisions customers get rid of wasteful meetings and make better decisions. 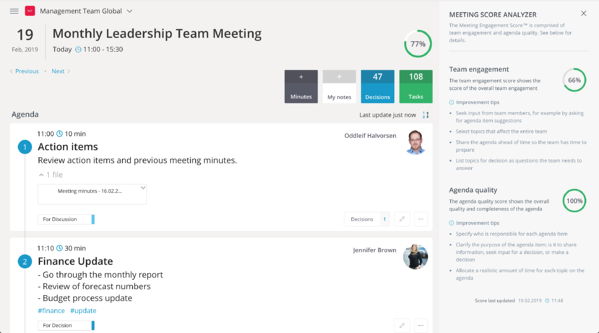 Leaders, project managers and meeting organizers can use the Meeting Engagement Score™ to start conversations. Would changing the date or sending the agenda farther in advance facilitate preparation? Across the company, is there a specific day when meetings seem to be most successful? Is time needed at the start of the meeting to scan the materials? Can presenters be given more time to provide background? If a score is consistently low, should the meeting be reconfigured or even canceled? Who is organizing successful meetings in the company and what tips do they have? What is your Meeting Engagement Score™? Get started with Decisions today to find out.